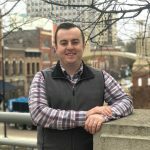 Travis McCroskey graduated from the University of Tennessee in 2008 with a Bachelor of Arts in Political Science and in 2011 received his Juris Doctorate from the University of Tennessee College of Law. He is a life long East Tennessean and he, his wife, his daughter, and their Bernese Mountain Dog live in Knoxville, Tennessee. Travis is active in his church and several community groups. He spends his spare time with his family, his book club, and enjoys reading, particularly books by Knoxville's favorite literary son, Cormac McCarthy.